Alan Kay famously said “The best way to predict the future is to invent it.” But how do we go about inventing a future that isn’t a simple linear extrapolation of the present? Kay and his colleagues at Xerox PARC did exactly that over the course of the 1970s and early 1980s. They invented and prototyped the key concepts of the Personal Computing Era. Concepts that were then realized in commercial products over the subsequent two decades. So, how was PARC so successful at “inventing the future”? Can that success be duplicated or perhaps applied at a smaller scale? I think it can. To see how, I decided to try to sketch out what happened at Xerox PARC as a pattern language. If your time horizon is short you are doing product development or incremental research. That’s all right; it’s probably what most of us should be doing. But if you want to intentionally “invent the future” you need to choose a future sufficiently distant to allow time for your inventions to actually have an impact. What technologies will be available to us in twenty years? Start with the current and emerging technologies that already exist today. Which relevant technologies are likely to see exponential improvement over the next twenty years? What will they be like as they mature over that period? Assume that as the technical foundation for your future. Think about how those technologies may affect people. What new human activities do they enable? Is there a human problem they may help solve? What role might those technologies have in everyday life? What could be the impact upon society as a whole? Based upon your technology and social extrapolations create a clearly articulated vision of what your desired future. It should be radically different form the present in some respects. If it isn’t, then invention won’t be required to achieve it. 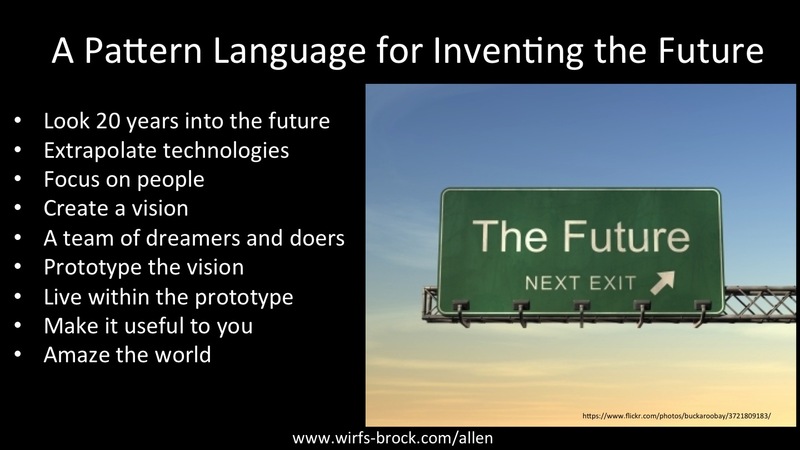 Inventing a future requires a team with a mixture of skills. You need dreamers who are able to use their imagination to create and refine the core future vision. You also need doers who are able to take ill-defined dreams and turn them into realities using available technologies. You must have both and they must work closely together. Try to create a high fidelity functional approximation of your vision of the future. Use the best of today’s technology as stand-ins for your technology extrapolations. Remember what is expensive and bulky today may be cheap and tiny in your future. If the exact technical combination you need doesn’t exist today, build it. It’s not enough to just build a prototype of your envisioned future. You have to use the prototype as the means for experiencing that future. What works? What doesn’t? Use you experience with the prototype to iteratively refine the vision and the prototypes. You’re a person who hopes to live in this future, so prototype things that will be useful to you. You will know you are on to something when your prototype become an indispensible part of your life. If it isn’t there yet, keep iterating until it is. If you are successful in applying these patterns you will invent things that are truly amazing. Show those inventions to the world. Demonstrate that your vision of the future is both compelling and achievable. Inspire other people to work towards that same future. Build products and businesses if that is your inclination, but remember that inventing the future takes more than a single organization or project. The ultimate measure of your success will be your actual impact on the future.